There are some things that just feel good in the hand and a silky and dense octagonal wa is one of them. 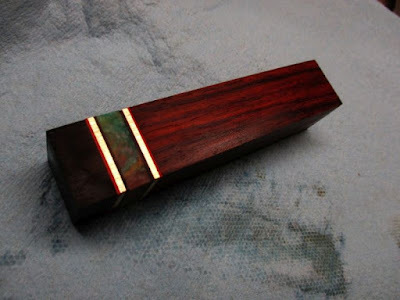 I am making a small honesuki and wanted to make nice handle with a little colour out of materials that I am confident will behave themselves in a home kitchen environment. Similar to the Hidden Tang Pinned tutorial and the Through Tang tutorial, this method requires the tang be tapered in both dimensions. This build is a little unorthodox. 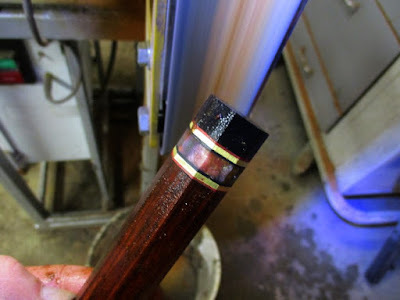 Most makers will slot a hardwood dowel and build the handle from two or more pieces with the ferrule end slotted before glue up. 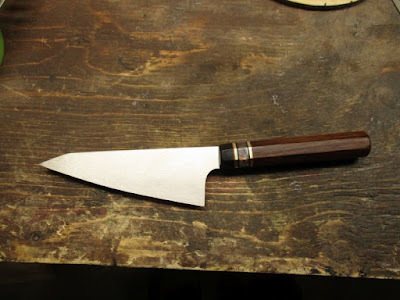 That method is okay, but because the slot is made before shaping the handle, the facets of the octagon must be perfectly true to the slot. 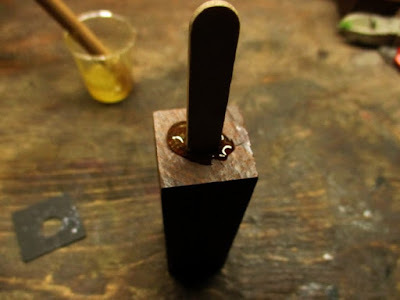 In this method, I make the best octagon I can, then slot it for accepting the tang. 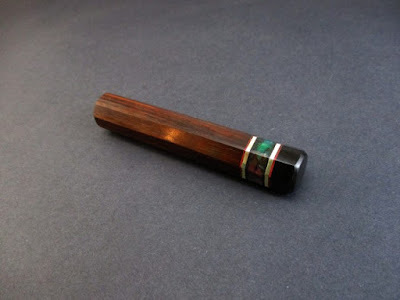 I chose Cocobolo which is an oily hardwood along with another similarly hard and naturally oily wood namely African blackwood for the ferrule end. For color, I've got some 1/4" thick Inlace Acrylester which is Abalone, which is a blend of kind of greens, blues, violets and reds. Really cool stuff that the pen turners love. 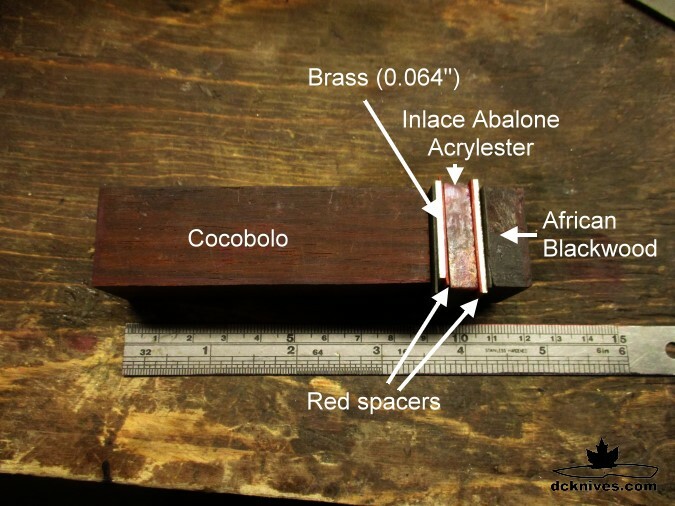 With a target handle length of 4.25" (108 mm) I start with a block of Cocobolo that I cut to 3.5" long on the mitre saw. 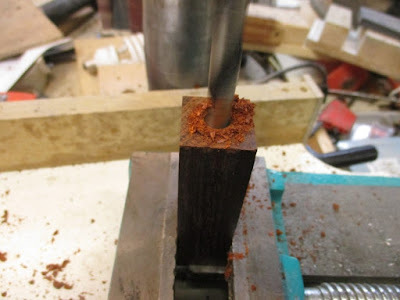 It is then ripped in into a 1-1/8" square on the band saw. This square dimension isn't critical, but more of a rough starting size as it will be shaped and squared smaller from here. I cut the Acrylester and the blackwood to approximately the same dimensions. Then the 1/16" brass and vulcanized fiber spacers. To bind the different components, I have some 3/8" poplar dowel. 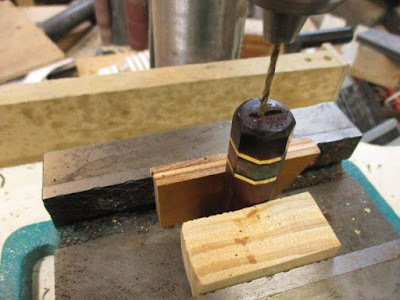 With the Cocbolo in the drill press vise, I bore a hole dead center with a 25/64" bit, This goes in about 2-1/2" inches. The dowel should slip in nicely. 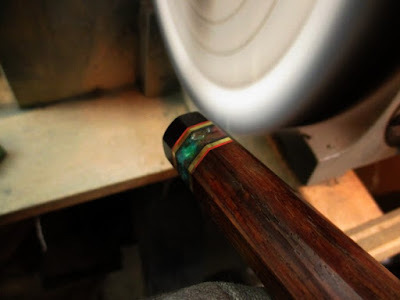 I shape the dowel ends to fit the hole as it's not a perfectly flat bottomed hole. With the vise and same bit I drill the other pieces. 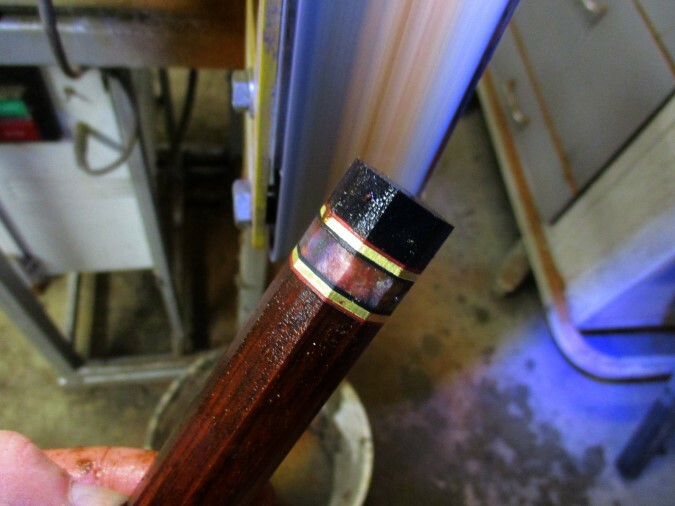 I do NOT drill the all the way through the blackwood ferrule . Only about 1/2 way. See the photo below. 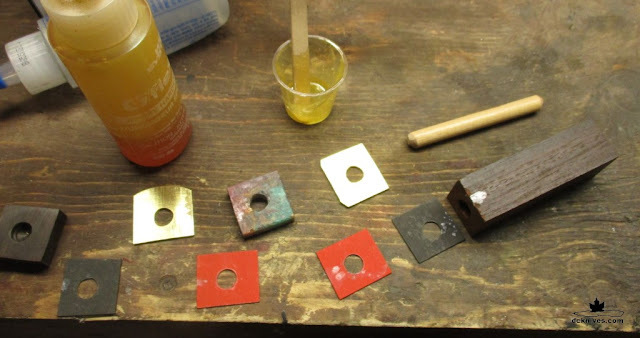 After dry fitting all the pieces, I scuff them with sandpaper and clean them with acetone. 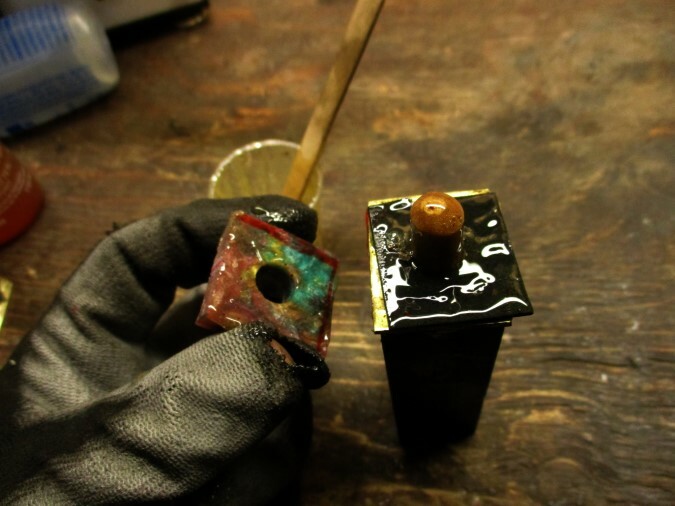 Mixing about 1 tablespoon (15 ml) of West System's G-flex epoxy. 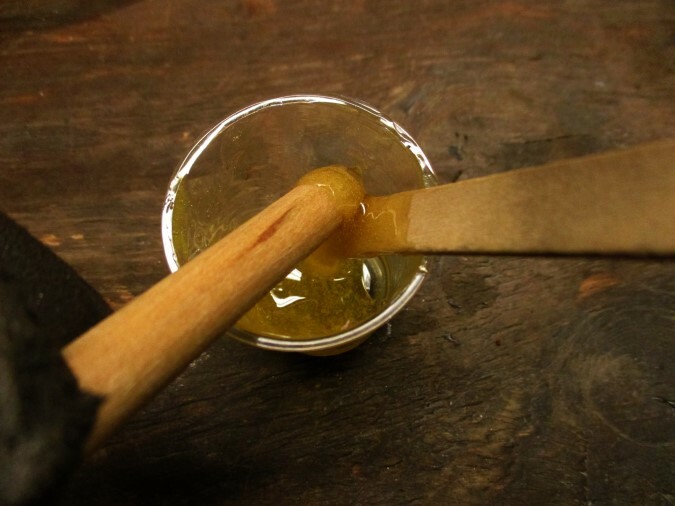 Using the Popsicle stick to get lots of epoxy into the hole. Extra will squeeze out and you can use the extra to spread on the next few pieces. Each layer gets epoxy on each surface. More is better than less. 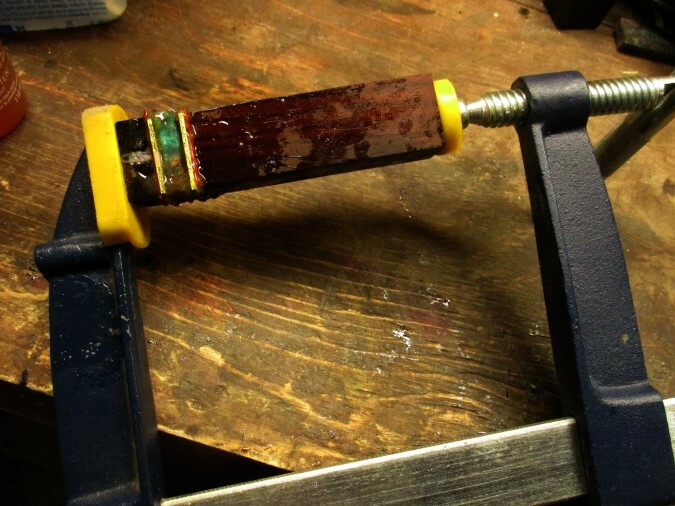 Now some gentle pressure in a bar clamp. I guesstimate the force around 10 lbs. 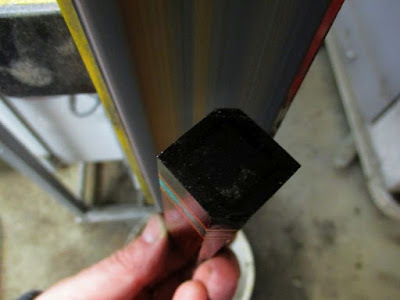 (5 kg) Do not over tighten the clamp as this will squeeze most of the epoxy out of the layers. You want some epoxy to bind all the surfaces. I waited a day and bit for this to harden. If the excess epoxy is not sticky to touch and super hard to chip off, it is ready to start sanding. Note that cold conditions really slow this epoxy down. Keep it in a warm place while it sets. The first sanding is to make the surfaces flat and square. The trusty 4 x 36" with an 80 grit belt works for this. The epoxy clogs belts, so I'd rather clog this old belt than a good 2x72" belt on the big grinder. This is the squared handle. 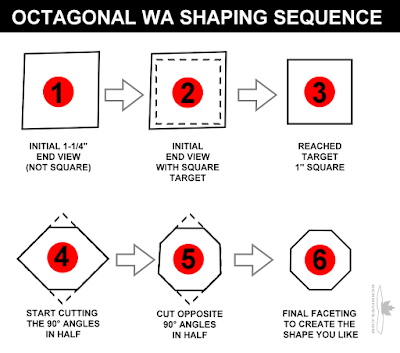 Step 3 in the sequence graphic. Now I am starting Step 4 of the sequence graphic. Each 90° angle I am focusing on evenly cutting in half to make two 45° angles. 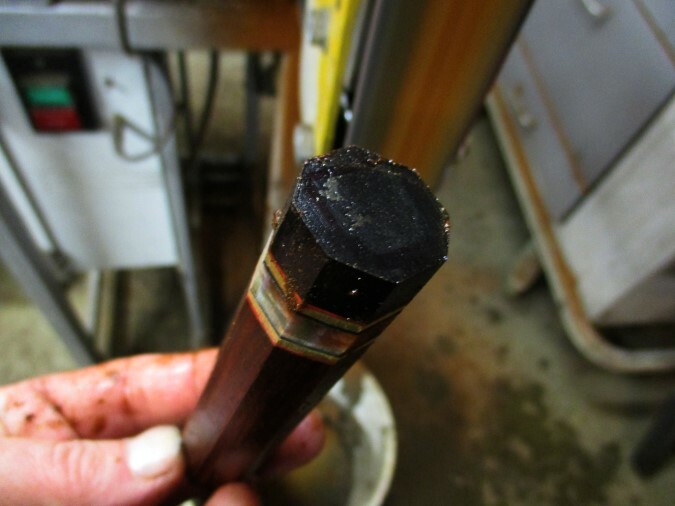 I dip the handle in water to reduce the heat buildup in the brass. The goal here is to keep the temperature low. 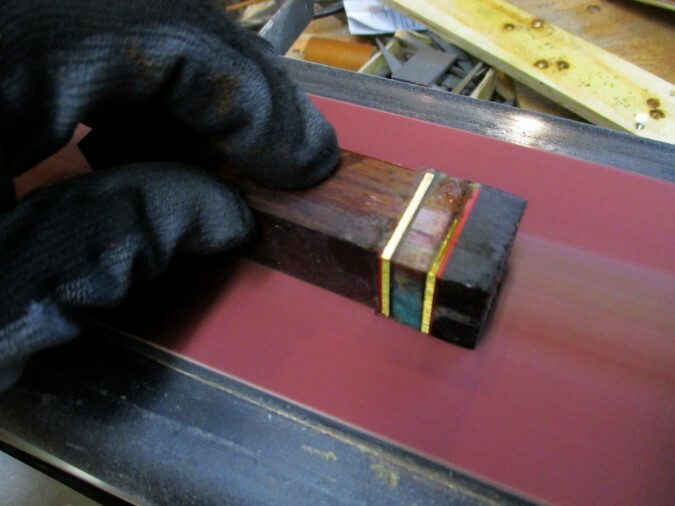 The brass can easily get past the safe temperature of the epoxy. So try to keep it under 50°C (122°F). If you cannot touch it with your bare fingers it has become too hot. 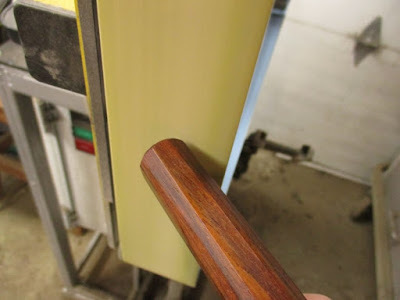 Hold the end of the handle at 45° and rotate it into the belt. This will make a nice faceted rounding effect on the end. 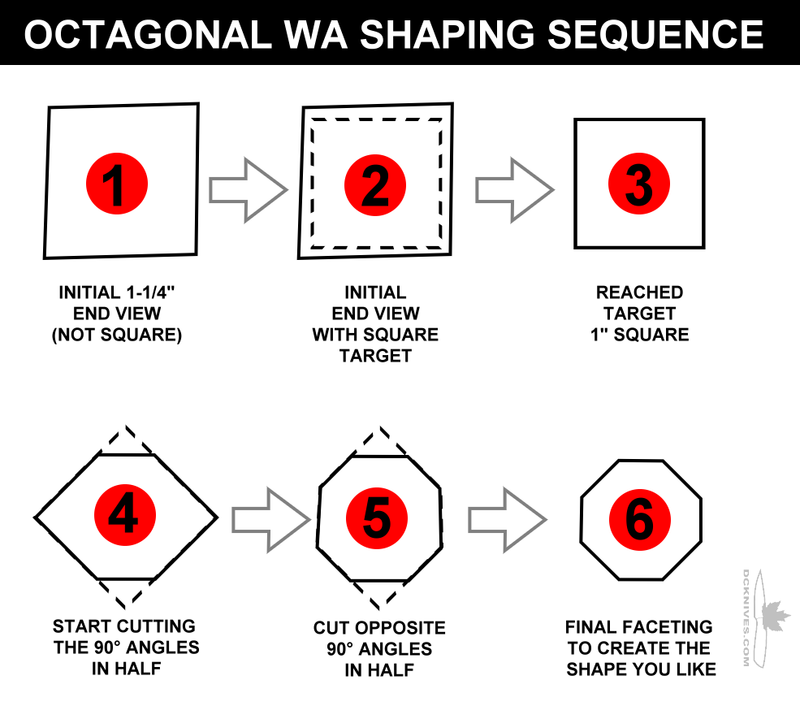 This is the sequence I go through in making an octagonal wa as seen from the end of the handle. This is the handle all pretty. Now to slot it to accept the tang of the blade. 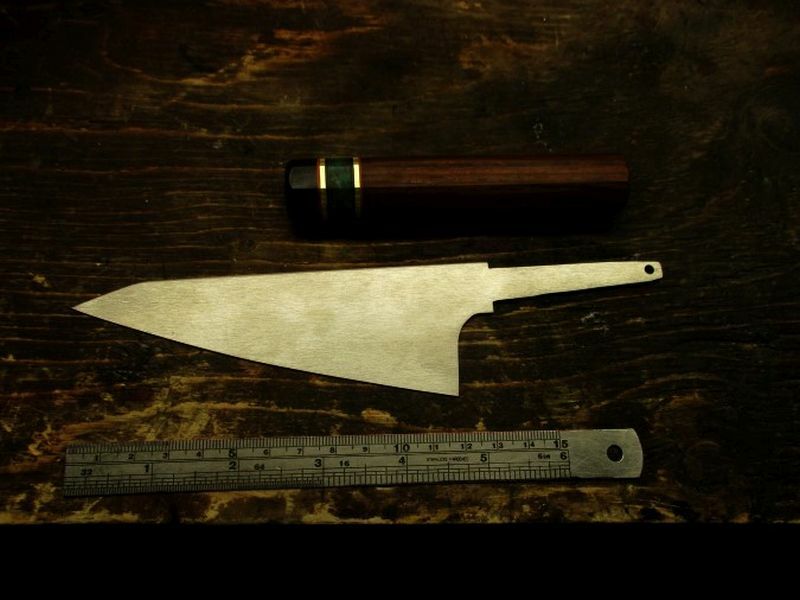 As mentioned near the top, it is critical when using this method that your tang is tapered in two dimensions. This can be tricky to get the slot nice and lined up. I have found that the vise on the drill press and a slightly undersized bit works well. In this case, the tang thickness at the shoulder is 3/32". I have a 5/64" bit and drill a series of holes in a straight line. Then moving the vise and raising and lowering the bit acts a bit like a milling machine. Additional material can be removed with a broach. 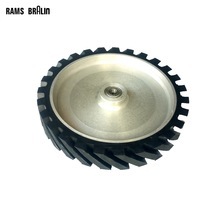 My favorite is a wood cutting jig saw blade. 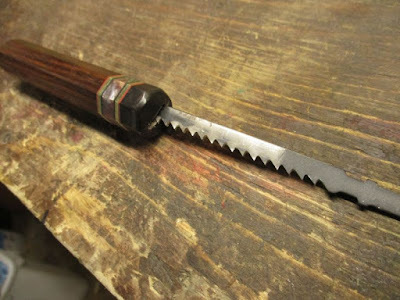 An alternate broaching tool is a good quality jig saw blade locked in the vise-grips. Easier on the hands too. Here's the blade for test fitting. 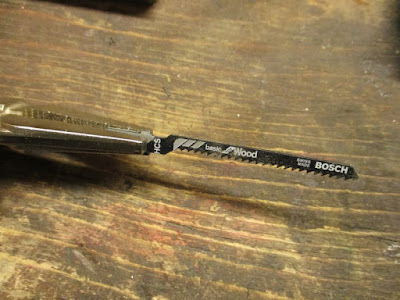 If you are having problems getting the depth you need, try wrapping the blade in a wet rag and clamping it the in the vise. Heat the very tip of the tang with a propane torch until it starts to glow orange, then immediately push the handle on. Here is the tang inserted into the handle. There is a small amount of filing with a needle file to shape the opening to accept the curve of the shoulder. Next, I will mix up some more epoxy, this time about 5ml (1 teaspoon) and add a few drops of black enamel paint. This will blend nicely with the African blackwood ferrule. 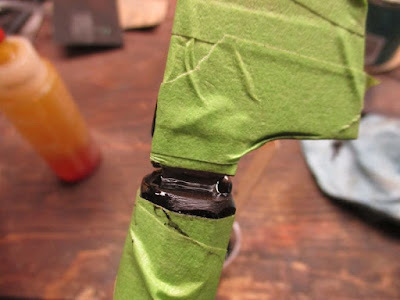 With the blade and handle taped off, fill the slot with epoxy. It will squeeze out when the tang is pressed in. 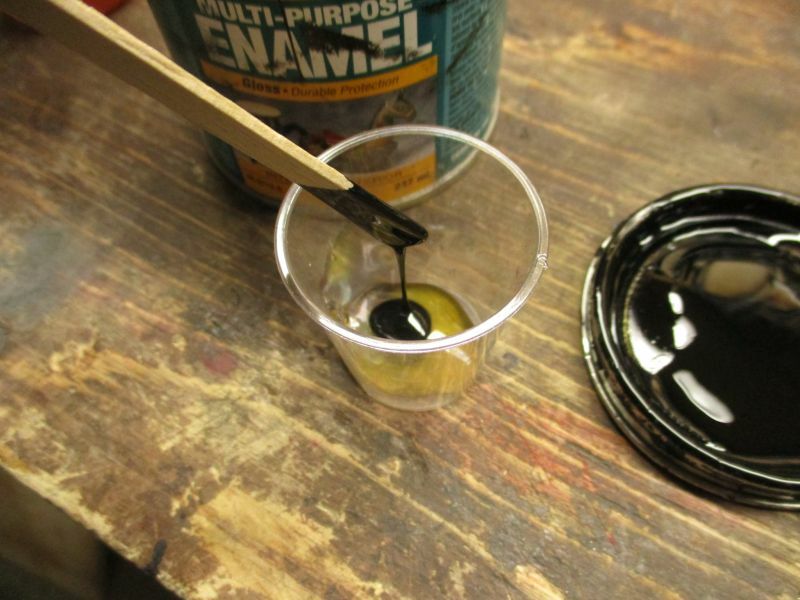 Wipe any excess epoxy off with a shop towel or Armor-all wipe. Your beautiful wa handle is attached and ready to use. I followed your steps and make a handle out of Lignum vitae wood. Everything came out perfect! That's some tough wood! I am glad it worked for you. Thanks for posting.